Today is Friday the 13th. For those who are superstitious it is a day to particularly avoid black cats and ladders. Historically Friday was considered unlucky, as well as the number 13; combine the two and you are asking for trouble. We have three this year. Today is our second Friday the 13, the last falling in June. It has been suggested that the popular novel published in 1907 titled Friday, the Thirteenth, was responsible for making the day popular. In the book, an unscrupulous broker takes advantage of the superstition to create a Wall Street panic on a Friday the 13th. It was a Saturday, 100 years ago, so not likely anyone would have had any inkling of what fate had in store for the passengers and crews of Titanic. Building Titanic represented the pinnacle of ship building, Belfast seen as the Cape Canaveral of the era. Everyone on board would have felt privileged to be part of history, but were on the ship for different reasons. First Class passengers were returning from the Continent, others in lower classes travelling with their families to start a new life in America. Human nature being what it is, you can imagine that after three days at sea the surroundings were now familiar, and everyone was settling into their own routines, enjoying this luxury liner. Crew members attended to duties below decks, and since the skies were clear, passengers would have enjoyed walks along the decks assigned to their class of travel. First class passengers who enjoyed a workout might have migrated to the gym, played squash, or swam a few laps in the pool; others might have attended one of the many Saturday church services. Printed menus which survived point to the amazing food which would have been enjoyed on board. The 2nd class menu was actually reproduced as a postcard for passengers to send home. Alas, all went awry Sunday night. Most sources seem to agree that Titanic collided with an iceberg at approximately 11:40 pm and had completely sunk at 2:20 am, April 15. There have been many media stories this week covering various aspects of this tragic disaster. Relatives and tourists are flocking to Belfast and to Halifax to be part of the experience, from Titanic‘s birth to final resting place. The only coverage I have seen in bad taste was on The Talk today. The “ladies” got all dressed up in period attire, opened the show on a Titanic float, showcased artifacts then proceeded to slam those were on memorial cruises. “Black people don’t do cruises” was actually funny, but comparisons to the Donner Party and Sara Gilbert suggesting that family members should have gotten closure after 100 years to be totally distasteful. I often have this show playing in the background in my home office, and gave them a lot of leeway, but sorry, no longer. Shame on you. 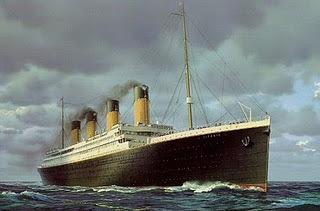 I believe that it is the personal stories of the 2,200 people on board which makes Titanic most compelling. Ordinary people performed the most extraordinary feats to save or comfort others. All engineers perished as they struggled to the end to keep the lights on so that passengers could find their way on deck. Canadians and Germans saw the final installment of the Julian Fellowes’ Titanic miniseries this week which will be broadcast on ABC tomorrow and Sunday. It did eventually grow on me as the stories evolved. I struck by the image of survivors in the lifeboats watching in disbelief as the great ship slipped into the water, leaving everything in darkness. We can’t help but wonder what would we have done when faced with the choice of taking a seat on a lifeboat if given the chance, or to stay behind and face death with loved ones. Please do take time this weekend to say a prayer for those who perished, survived, were involved in rescue recovery efforts, as well as their families. Thank you to those who continue to keep the memory alive. I have said before that many of us cook as an expression of love for family and friends. For me, cooking through the recipes was more than just understanding food fashion of the Edwardian period, it was a way to connect with those on board– from those who cooked the meals below deck to the passengers who enjoyed the feasts. I hope that my journey through the three menus of the last meal on Titanic have served as inspiration for the dinners many of you are planning this weekend. 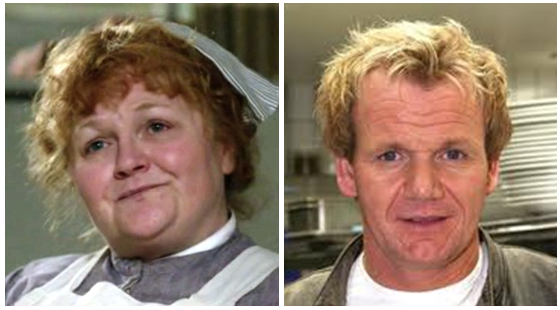 I have heard from some of you through comments on this blog, on Twitter (@downtoncooks), on my Facebook page, and on my Titanic Pinterest board. I have included a game plan and a modified 1st class menu if 10+ courses is too ambitious. The menus have something from everyone, including Jessica Brockmole, an early 20th century novelist whom I met on Twitter yesterday, looking for dishes her 8 year old Titanorak would eat. According to Jessica, “we’re going with barley soup, chicken Lyonnaise, chateau potatoes, creamed carrots, minted peas, asparagus salad, eclairs & ice cream”. Special thanks to Canadian food icon, Dana McCauley for all the dishes she researched for Last Dinner on the Titanic, and whose many recipes I have relied on. The book is a wonderful collection of recipes, and stories from Titanic. I would also like to thank fellow Canadian Paula Costa who blogs at Dragons Kitchen who also took up the Titanic challenge a few years ago. Her wonderful photography helped me imagine what some of these dishes should actually look like, and today I actually use her photography so you can judge for yourself. For those of you who are hosting or attending “home based” events, please do share your stories and pictures with me. I will try to share as many as I can on a future post. I might even be able to scrounge up a book prize or two for the best entries. Saving the best recipe in 1st Class for our last day, this dish is a great example of pure Edwardian excess. You may wish to save this recipe for a meal on its own, perhaps for a Downton Abbey season finale party. Fois gras is still a luxury item, as are black truffles. Even the Dowager Countess would be impressed with this dish should it had been served at Downton. Recipe by Dana McCauley from Last Dinner on the Titanic. In saucepan, melt 1 tablespoon of the butter over medium heat; add shallots and cook, stirring often, for 5 minutes or until softened. Stir in tomato paste, bay leaf and rosemary until well combined. Stir in cognac, Madeira and red wine; bring to boil. Boil for 10 minutes or until reduced to about 1/2 cup. Stir in beef stock. Boil for 15 minutes or until reduced to about 1 cup. Strain into clean pot set over low heat and whisk in remaining butter. Season to taste. Brush 11-inch oven-proof skillet with enough melted butter to coat. Arrange potatoes in overlapping circles, brushing each layer with enough butter to coat; sprinkle each layer with some of the salt and pepper; press top layer gently down. Place pan over medium-high heat for about 10 minutes or until bottom is browned. Cover and bake in 450°F oven for 15 minutes or until potatoes are tender and lightly browned on top. Broil for 1 to 2 minutes or until brown and crisp. Meanwhile, sprinkle meat with salt and pepper. In large skillet, melt butter with vegetable oil over medium heat; add garlic and cook, stirring often, for 2 minutes; increase heat to medium-high and add filets mignons. Cook, turning once, for 10-12 minutes or until well-browned but still pink in middle. Remove from pan and let stand, tented with foil, for about 5 minutes. Wipe out pan and return to high heat. 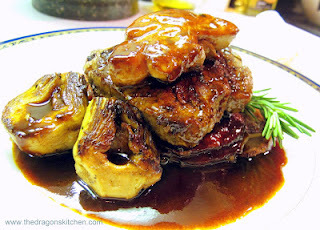 Add foie gras and cook for 30 seconds per side or until golden brown. Remove from pan and reserve. Gently toss artichokes in pan juices and cook for 2 minutes or until heated through. Cut cooked potato rounds into 6 portions and place 1 piece, upside down, on each of 6 heated plates; top with a filet mignon, followed by a slice of foie gras and a truffle slice (if using). Ladle sauce around edge of plate; garnish with artichokes. One final dish to prepare from our extensive menus. It was served as part of the Filet Mignon dish above, but it also held its own served cold as the Ninth Course in 1st Class. Revered as one of the most exquisite foods in the world, foie gras is synonymous with great taste and unabashed elegance. While Edwardians relished this special dish, it is more controversial today. Geese are force fed to improve the flavour of their enlarged livers which form the base of the dish, and its production is being increasingly regulated, and banned in some parts of the world. I thought it appropriate to delegate this dish to an English chef who reminds me a great deal of Mrs. Patmore, the beloved cook of Downton Abbey.